Providence, R.I. • Aug. 11, 2013 — FLICKERS: Rhode Island International Film Festival (RIIFF) proudly announced the award winners for its 17th annual festival, on Sunday, Aug. 11, at its awards ceremony held at The Metcalf Auditorium at the RISD Museum in downtown Providence, RI. This year’s Festival took place Aug. 6–11, 2013, and had a record-breaking year in attendance for ticket buyers and filmmakers, including more than 800 people at the Opening Night Celebration. More than 200 feature length, documentary and short films—from 65 countries, and 36 states across the U.S.—were screened during the six-day Festival at locations throughout the state of Rhode Island. Films were selected from a record entry base of 5,114 submissions, and this year’s Festival included 55 World, North American, and U.S. Premieres. RIIFF is one of only 75 film festivals worldwide that is accredited by the Academy of Motion Picture Arts and Sciences (AMPAS). RIIFF has seen 29 films that premiered at the Festival go on to receive Oscar® nominations with six (6) winning the Award. At the February 2013 Academy Awards, three of the short film nominees shared the distinction of having premiered at Opening Night of RIIFF 2012: “ASAD,” directed by Bryan Buckley and produced by Mino Jarjoura (Hungry Man); “Buzkashi Boys,” directed by Sam French and produced by Ariel Nasr (Afghan Film Project); and “Henry,” directed and produced by Yan England. The winner of the RIIFF Best Short Grand Prize holds a special honor: it becomes the Festival’s nominee for Academy Award consideration. The 2013 Grand Prize winner is “Drone Strike,” by U.K. director Chris Richmond. 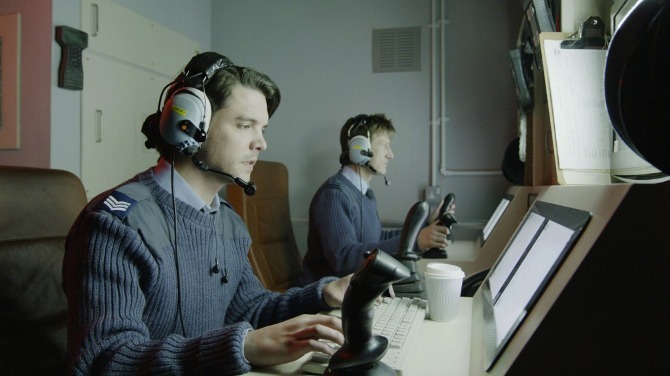 As Richmond’s dramatic directorial debut, “Drone Strike” depicts a day in the life of a devoted family man who serves as a RAF drone pilot, and who struggles with the warped reality of having a day job in the U.K. that consists of firing Hellfire missiles 4000 miles away in Afghanistan. This film tells the story of how one fateful decision shatters his conviction, and shows the effects of that decision on a family in Helmand Province. The 2013 Flickers: Rhode Island International Film Festival was dedicated Dr. J. Gerald Lamoureux, of Woonsocket, who passed away this year. A lifelong resident of Woonsocket, Dr. Lamoureux was a strong force in the francophone community and worked to keep the Quebecois culture alive in Rhode Island. He worked with Flickers to help create the French Festival Jubilee Franco-Americain in Woonsocket in1995, and acted as its vice president for many years. This Jubilee grew into what is now the Rhode Island International Film Festival, which represents the entire world through its film selection while keeping a special spotlight on the French language—and Franco-American community in Woonsocket—by building strong partnerships with Quebecois and French organizations and festivals. •	CREATIVE VISION AWARD was presented to Welsh actor, Ioan Gruffudd. 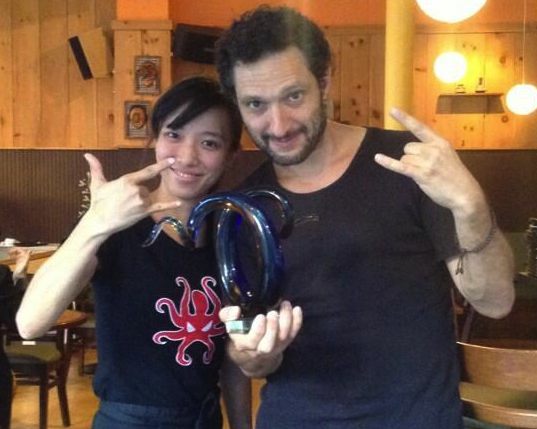 The Award celebrates passion and creativity within the world of cinema. Gruffud made a lasting impression in film through his roles in “Titanic,” “The Fantastic Four,” “Fantastic Four: Rise of the Silver Surfer,” ”King Arthur,” “Amazing Grace,” the British series “Poldark” and “Hornblower,” and the American series “Ringer.“ He stars in “Foster” which had its North American Premiere at RIIFF this year. Past recipients include Actor/Director Federic Castelluccio, Actor Jonathan Katz, Actress Blythe Danner, Director Michael Corrente, German Writer/Director Rosa von Praunheim, and Founder of the Newport Jazz Festival Elaine Lorillard. •	ROGER WILLIAMS INDEPENDENT VOICE AWARD was presented to writer/filmmaker G. Wayne Miller. The award is presented semi-annually to an outstanding artist whose vision promotes tolerance, compassion and understanding. The award is named after the founder of Rhode Island, Roger Williams, who established an American tradition of religious freedom and individual liberty that was encoded in The Bill of Rights. This award honors a truly unique American whose ethics, philosophy and conscience reflects that of Roger Williams, who provided a refuge from rampant religious persecution, an open door to all people; a safe harbor in a vast sea of tyranny and oppression. •	RIIFF SCREENPLAY COMPETITION AWARD was presented to Alfred Thomas Catalfo, of New Hampshire, for his screenplay for “Betrayed.” This award is presented to the Grand Prize winner of the FLICKERS: Rhode Island International Film Festival Screenplay Competition. Mr. Catalfo was also a special guest at the 2013 ScriptBiz screenwriting workshop on Friday, Aug. 9, 2013. 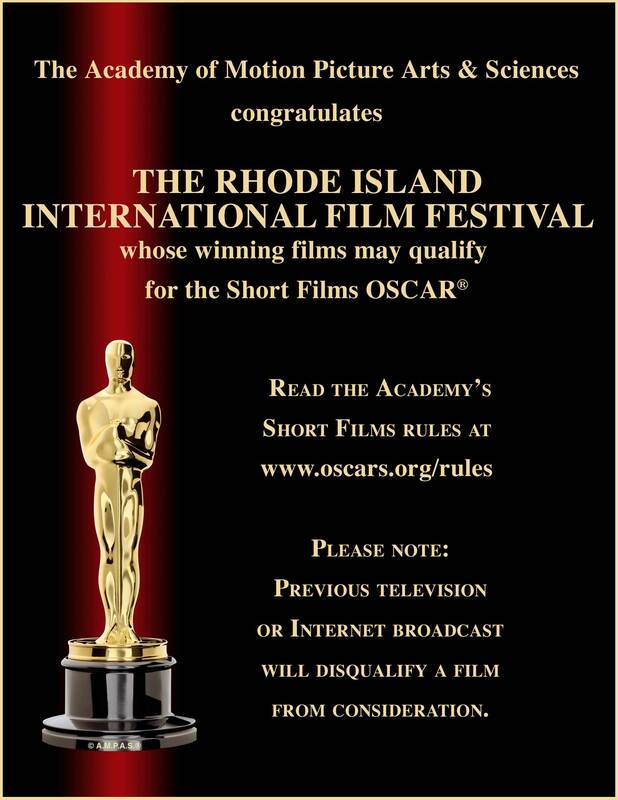 •	SPOTLIGHT ON RHODE ISLAND AWARD was presented to Rachel Smith of Hope, RI, for her screenplay for “Fix You Up.” This award is presented to a writer whose screenplay focuses on the spirit and character of Rhode Island. •	PRODUCER’S CIRCLE AWARDS were presented to Rhode Islanders Lew Place (North Smithfield, RI), Photographer and Webmaster, RI Film & Television Office; Dana Neugent (Newport, RI), Film Media Professor at University of Rhode Island; and Sherilyn Brown (Cranston, RI), Rhode Island State Council on the Arts. The Producers Circle Awards are presented to members of the community who have actively worked to support and promote the mission of the Flickers: Rhode Island International Film Festival. These Friends of the Festival have had a significant impact on the growth, evolution and quality of what has become RIIFF. •	CRYSTAL IMAGE AWARD was presented to Rhode Island actors CJ Adams (“Against the Wild,” “The Odd Life of Timothy Green,” “Dan in Real Life”) and Robert Capron (“The Way, Way Back,” “Diary of a Wimpy Kid,” “Frankenweenie”). The Crystal Image Award is presented to emerging artists whose outstanding work and vision epitomize new voices that must be heard; actors whose talent will have a positive impact in the future. •	ROBERT ALDRICH “NEW DIRECTOR OF THE YEAR” AWARD was presented to Tom DeNucci during the Rhode Island Film Forum. Robert Burgess Aldrich, of Cranston, RI, was a successful director of many feature films and utilized a variety of genres to tell his stories. His films included “The Longest Yard,” “The Dirty Dozen,” “Flight of the Phoenix,” “Hush,” and countless others. Robert Aldrich began his career in Cranston, RI, and ultimately rose in the Hollywood ranks to be the President of the Directors Guild of America, serving from 1975-1979. This Award is presented to a director who has begun his career in Rhode Island and is following in the footsteps of Robert Aldrich, preparing to make a lasting mark on the industry. •	RHODE ISLAND “PRODUCER OF THE YEAR” AWARD was presented to Chad A. Verdi. The RI Producer of the Year Award was created this year to recognize someone who really knows what it means to produce—in both quantity and quality—in the Ocean State. Chad Verdi, of East Greenwich, RI, is such a person. In 2013 alone, he produced “Self Storage,” “Army of the Damned,” “A Bet's a Bet,” and is now in preproduction on “Bleed For This.” This latter film is the story of Vinny Paz (formerly Vinny Pazienza, an Italian-American former boxer and world champion in the lightweight and light middleweight weight classes from Rhode Island), and will be produced in Rhode Island this year with a budget of $15–$20 million. He has worked with talent including Kristen Chenoweth, Mena Suvari, Jonathan Silverman, Kenan Thompson, Eric Roberts, Robert Englund, William Forsythe, and many others, while maintaining a commitment to developing and nurturing the talents of actors and filmmakers in Rhode Island and building an industry right here in the Ocean State. Sponsored by the Government of Québec, the award provides a full pass for a New England-based director to attend the Montreal Festival of Nouveau Cinema, meet with Québec filmmakers and stay in the City. Presented by the Graham H. Carter, program manager & members of the 2013 RIIFF Youth Film Jury. The mission of the Flickers, the Newport Film Society & Arts Collaborative - now in its 30th year - has been to serve as a creative partner in the arts by uniting various media and arts disciplines that nurture the artistic process and support a vital part of our community. 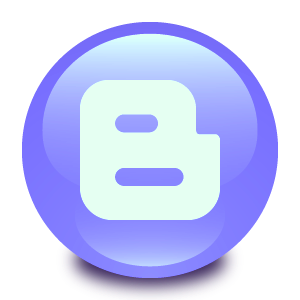 This includes multi-disciplinary art presentations; artistic and cultural activities; performance festivals; video and television productions; audio recordings and broadcasts; educational outreach programs; and the FLICKERS: Rhode Island International Film Festival (RIIFF). The FLICKERS: Rhode Island International Film Festival (RIIFF), has secured its place in the global community as the portal for the best in international independent cinema, earning the respect of domestic and foreign filmmakers, filmgoers and trend watchers. This confluence of art and commerce brought together world-class celebrities, award-winning filmmakers, new talent and audience members in record numbers last year. Ranked as one of the top 12 Festivals in the United States, RIIFF is also a qualifying festival for the Short Film Academy Award through its affiliation with the Academy of Motion Picture Arts & Sciences. 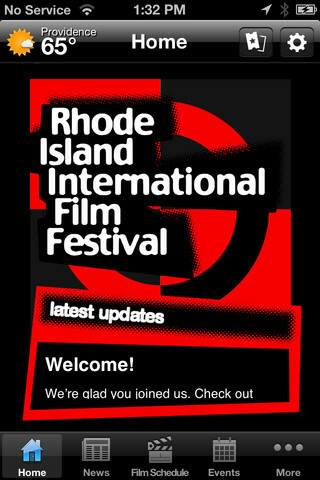 There are 75 film festivals worldwide which share this distinction and RIIFF is the only festival in New England.